Scientists have found that bacteria that grow in the oral cavity can be taken into the lungs to cause respiratory diseases such as pneumonia. This is true especially in people with periodontal disease. Respiratory disease occurs when fine condensations are inhaled from the mouth and throat into the lungs. These droplets contain germs that can spread and multiply within the lungs to impair breathing. Recent research had also proven that bacteria found in the mouth and throat can be drawn into the lower respiratory tract and cause infection or worsen existing lung conditions. 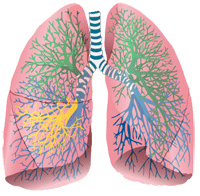 People with respiratory diseases, such as chronic obstructive pulmonary disease (COPD), typically suffer from reduced protective systems, making it difficult to eliminate bacteria from the lungs. Individuals may be genetically predetermined to respond differently to a challenge, such as bacteria, and therefore their level of disease may be different. There is speculation that periodontal pathogens not only are responsible for respiratory tract infection, but also that these pathogens may affect the local defence mechanisms of the region to increase patients’ risk for respiratory disease. Both periodontal disease and respiratory disease are often classified as inflammatory conditions, so it may be possible that inflammation may be a factor in the link between the two. Periodontal disease is a chronic, inflammatory disease that can impact overall health, and therefore, we treat our patients accordingly. This means conducting a comprehensive periodontal evaluation on a biannual basis to ensure that periodontal disease is caught early and an appropriate treatment plan can be established. Our experienced dentists and dental hygienists work together to ensure that each patient receives a comprehensive examination, including intra-oral, extra-oral evaluations; a thorough assessment of plaque, calculus, and gingival inflammation; probing around each tooth; assessment and documentation of recession and attachment loss around teeth; radiographic evaluation of bone loss; and an assessment of patient-associated risk factors such as age, smoking, and the presence of other chronic, systemic conditions associated with systemic inflammatory burden.